^ 1.0 1.1 1.2 1.3 1.4 1.5 1.6 737 Model Orders and Deliveries data.. Boeing. 2018-10 [2018-12-04]. （原始内容存档于2018-11-06）. ^ 2.0 2.1 2.2 2.3 2.4 Current Price. Boeing Commercial Airplanes. [2018-12-04]. （原始内容存档于2018-12-04）. ^ 4.0 4.1 波音宣布停止交付737Max客机. [2019-03-16]. （原始内容存档于2019-03-27）. ^ "Boeing firms up 737 replacement studies by appointing team." 页面存档备份，存于互联网档案馆 Flight International, March 3, 2006. Retrieved April 13, 2008. ^ Hamilton, Scott. "737 decision may slip to 2011: Credit Suisse." Archive.is的存檔，存档日期2010-07-01 Flightglobal, 2010. Retrieved June 26, 2010. ^ Airbus launches A320neo. Australia Aviation. 2010-12-01 [2011-09-05]. （原始内容存档于2011-09-08）. ^ Bryan, Victoria; Jones, Rhys. Airbus wins record $18 billion order from AirAsia. Reuters. 2011-06-23 [2011-09-05]. （原始内容存档于2011-09-02）. ^ Rothman, Andrea; Wang, Jasmine. AirAsia Tops IndiGo Record Order as Asia Dominates Air Show. Bloomberg. 2011-06-24 [2011-09-05]. （原始内容存档于2011-06-27）. ^ O'Keeffe, Niall. "Caution welcomed: Boeing's 737 Max" 页面存档备份，存于互联网档案馆. Flight International, September 12, 2011. ^ Boeing Launches 737 New Engine Family with Commitments for 496 Airplanes from Five Airlines. Boeing. 2011-08-30 [2011-09-05]. （原始内容存档于2012-08-27）. ^ Ostrower, Jon. Boeing says 737 MAX to meet or exceed A320neo range. Flightglobal.com. [2012-02-19]. （原始内容存档于2012-02-17）. ^ Boeing’s 737 MAX takes wing with new engines, high hopes. the Seattle Times. 2016-01-29 [2016-01-30]. （原始内容存档于2016-01-30）. ^ Type Certificate Data Sheet No. A16WE (PDF). FAA. 2017-03-08 [2018-12-08]. （原始内容存档 (PDF)于2017-11-13）. ^ Ostrower, Jon. Boeing designates 737 MAX family. Air Transport Intelligence. 2011-08-30 [2011-09-05]. （原始内容存档于2011-09-25）. ^ Lion Air commits to up to 380 Boeing 737s. 2011-11-17 [2011-11-17]. （原始内容存档于2011-11-19）. ^ ACG Becomes third identified 737 MAX customer. 2011-11-17 [2011-11-17]. （原始内容存档于2011-11-20）. ^ Southwest Airlines' Proud History of the Boeing 737. 2011-12-13 [2011-12-13]. （原始内容存档于2012-01-07）. ^ 737 MAX commitments top 948. [2011-12-15]. （原始内容存档于2013-12-30）. ^ 21.0 21.1 Bader, Tim. Boeing 737 MAX Logs First Firm Order from Launch Customer Southwest Airlines. Boeing. 2011-12-13 [2011-12-26]. （原始内容存档于2012-01-07）. ^ Norwegian buys 222 new aircraft. E24 (Norwegian). 2012-01-25 [2013-07-21]. （原始内容存档于2013-05-29）. ^ 23.0 23.1 Bader, Tim. Boeing and Norwegian Announce order for 100 737 MAX; 22 Next-Generation 737s. Boeing. 2012-01-25 [2012-01-25]. （原始内容存档于2012-04-18）. ^ Copeman, Emma. Virgin Australia orders 23 Boeing 737 MAX aircraft (PDF). Virgin Australia. 2012-07-05 [2012-07-05]. （原始内容存档 (PDF)于2013-12-28）. ^ Virgin Australia Orders 23 Boeing 737 MAX Aircraft. Reuters. Aviation Week. 2012-07-05 [2012-07-05]. （原始内容存档于2013-05-15）. ^ "Boeing Gets $7.2 Bln Order From Air Lease". [2013-07-28]. （原始内容存档于2013-12-29）. ^ Boeing and Air Lease Corporation Announce Order for 75 737. Boeing. （原始内容存档于2013-07-01）. ^ "United Airlines Orders 150 Boeing 737s, Including 100 737 MAX 9s". [2013-07-28]. （原始内容存档于2013-07-10）. ^ Aeromexico places $11 billion order with Boeing. （原始内容存档于2013-12-28）. ^ "SilkAir signs LOI for 31 Boeing 737-8s, 23 737-800s". [2013-07-28]. （原始内容存档于2012-08-20）. ^ Boeing, Avolon Finalize Order for 737 MAXs and Next-Generation 737s. （原始内容存档于2012-10-17）. ^ Bader, Tim. Gol anuncia nova compra de 60 jatos boeing 737 max. g1. 2012-10-01 [2012-10-01]. （原始内容存档于2012-10-04）. ^ Morgan, Adam. Boeing, GOL Announce order for 60 737 MAX Airplanes. Boeing. 2012-10-01 [2012-10-01]. （原始内容存档于2012-10-06）. ^ 35.0 35.1 "Gol orders 60 737 MAX aircraft". [2013-07-28]. （原始内容存档于2013-12-13）. ^ 36.0 36.1 "Boeing, GECAS Finalize Order for up to 100 737 MAXs and Next-Generation 737s". 页面存档备份，存于互联网档案馆 Boeing, Oct 3, 2012. ^ Gates, Dominic. Firm orders roll in for Boeing 737 MAX. The Seattle Times. 2012-10-04 [2013-02-16]. （原始内容存档于2013-12-29）. ^ 39.0 39.1 "Boeing, Alaska Airlines Announce Order for 737 MAXs and Next-Generation 737s" Archived 2012-10-11 at WebCite. Boeing, Oct 11, 2012. ^ Boeing, Aviation Capital Services Announce Commitment for 35 737 MAXs. Boeing via mediaroom.com. 2012-10-30 [2012-11-13]. （原始内容存档于2012-11-03）. ^ 41.0 41.1 Boeing, ALAFCO Firms up Order for 20 Boeing 737 MAXs. Boeing via mediaroom.com. 2012-11-04 [2012-11-13]. （原始内容存档于2013-01-04）. ^ 42.0 42.1 Blachly, Linda. Aeromexico finalizes 737 MAX order. ATWOnline. 2012-11-04 [2012-11-13]. （原始内容存档于2012-11-09）. ^ Boeing, SilkAir Finalize Order for 54 737s. Boeing via mediaroom.com. 2012-11-14 [2013-02-16]. （原始内容存档于2012-11-16）. ^ Icelandair Group and Boeing Have Signed a Commitment for New Aircraft. Icelandair. 2012-12-06 [2012-12-06]. （原始内容存档于2014-01-13）. ^ Boeing, Icelandair Announce Commitment for 12 737 MAXs. Boeing via mediaroom.com. 2012-12-06 [2013-02-16]. ^ Boeing 737 MAX Gets Milestone Order from Aviation Capital Group. Boeing via mediaroom.com. 2013-01-02 [2013-02-16]. （原始内容存档于2013-02-02）. ^ Boeing Gets $6 Billion Order for 60 737 Max Aircraft, Hits 1,000 Milestone. Frequent Business Traveler. 2013-01-02 [2013-02-16]. （原始内容存档于2013-01-06）. ^ Boeing, Icelandair Finalize Order for 16 737 MAX Airplanes - Feb 13, 2013. Boeing via mediaroom.com. [2013-02-16]. ^ 49.0 49.1 Boeing, Turkish Airlines Finalize Order for 50 737 MAXs, 20 Next-Generation 737s. Boeing via mediaroom.com. 2013-05-14 [2013-07-28]. （原始内容存档于2013-06-15）. ^ 50.0 50.1 Boeing, Southwest Airlines Announce Launch of 737 MAX 7. 2013-05-15 [2013-05-15]. （原始内容存档于2013-05-17）. ^ Boeing and TUI Travel PLC Announce Commitment for 60 737 MAX Airplanes. Boeing. 2013-05-31 [2013-07-28]. （原始内容存档于2013-06-27）. ^ TUI shareholders approve 737 Max order. Flightglobal Pro. flightglobal. 2013-07-10 [2013-07-10]. （原始内容存档于2013-07-15）. ^ Skymark Airlines Intends to Select the 737 MAX for Fleet Renewal Program. Boeing. 2013-06-17. ^ 54.0 54.1 Boeing, CIT Announce Order for 30 737 MAX 8s. Boeing. 2013-06-19 [2013-07-28]. （原始内容存档于2013-06-28）. ^ Boeing and Travel Service Announce Commitment for Three 737 MAXs. Boeing via mediaroom.com. 2013-06-19 [2013-07-20]. （原始内容存档于2013-06-25）. ^ Moores, Victoria. Norwegian performs first transatlantic 737 MAX flight. Aviation Week Network (Penton). 2017-07-18 [2017-07-19]. （原始内容存档于2017-07-18）. ^ Boeing Introduces 737 MAX With Launch of New Aircraft Family. Boeing. 2011-08-30 [2011-09-05]. （原始内容存档于2012-08-27）. ^ Matt Molnar. Boeing Says Radical New Winglets on 737 MAX Will Save More Fuel. NYCAviation. 2012-05-02 [2012-05-03]. （原始内容存档于2012-05-03）. ^ Boeing aims to minimise 737 Max changes. Flightglobal. 2011-08-31 [2018-12-04]. （原始内容存档于2018-12-04）. ^ Polek, Gregory. Boeing Takes Minimalist Approach to 737 MAX. Aviation International News. 2011-11-13 [2018-12-04]. （原始内容存档于2018-11-07）. ^ Ostrower, Jon. More details emerge on configuration of re-engined 737. Flight International. 2011-08-30 [2018-12-04]. （原始内容存档于2019-03-30）. ^ Jon Ostrower. Boeing narrows 737 MAX engine fan size options to two. Air Transport Intelligence News. 2011-08-31 [2018-12-04]. （原始内容存档于2019-03-27）. ^ Boeing reveals 737 Max configuration details. Flight International. 2011-11-03 [2018-12-04]. （原始内容存档于2018-12-22）. ^ Boeing Cites 600 Commitments For 737 MAX. Reuters. 2011-11-03 [2018-12-04]. （原始内容存档于2018-12-04）. ^ Jon Ostrower. Boeing Tweaks Engine for New 737 MAX. The Wall Street Journal. 2012-05-17 [2018-12-04]. （原始内容存档于2018-12-05）. 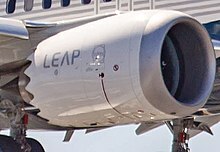 ^ CFM International démarre le premier LEAP-1B du 737 MAX. Le journal de l'aviation. 2014-06-18 [2015-03-05]. （原始内容存档于2014-07-03）. 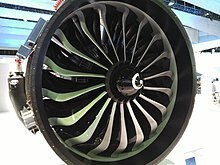 ^ CFM LEAP-1B ACHIEVES JOINT EASA / FAA CERTIFICATION. CFM International. 2016-05-04 [2018-12-08]. （原始内容存档于2018-12-09）. ^ TYPE-CERTIFICATE DATA SHEET for LEAP-1B series engines (PDF). EASA. May 2018 [2018-12-04]. （原始内容存档 (PDF)于2018-12-05）. ^ Aaron Karp. Boeing suspends 737 MAX flights, cites ‘potential’ CFM LEAP-1B issue. Air Transport World (Aviation Week Network). 2017-05-10. ^ Stephen Trimble. Boeing delivers first 737 Max. Flightglobal. 2017-05-16 [2018-12-08]. （原始内容存档于2018-12-29）. ^ Stephen Trimble. Boeing resumes 737 Max 8 test flights. Flight Global. 2017-05-12 [2018-12-08]. （原始内容存档于2019-03-30）. ^ Boeing Business Jets Unveils BBJ MAX 7 (新闻稿). Boeing. 2016-10-31 [2018-12-04]. （原始内容存档于2018-10-31）. ^ Milestone paves the way for delivery of the newest version of the best-selling business jetliner (新闻稿). Boeing. 2018-04-16 [2018-12-04]. （原始内容存档于2018-10-31）. ^ 737 MAX Airport Compatibility Brochure (PDF). Boeing. June 2017 [2018-11-27]. （原始内容存档 (PDF)于2018-09-28）. ^ 737 MAX. Boeing. Technical Specs. [2018-11-27]. （原始内容存档于2018-11-27）. ^ 737 MAX Airplane Characteristics for Airport Planning (PDF). Boeing. August 2017 [2018-11-27]. （原始内容存档 (PDF)于2017-10-23）. ^ Boeing 737 Technical Information 页面存档备份，存于互联网档案馆, Boeing Commercial Airplanes. ^ Flight, Boeing Defines the 737 MAX. [2013-07-28]. （原始内容存档于2013-04-06）. ^ Boeing, Lion Air Finalize Historic Order. [2013-07-28]. （原始内容存档于2012-09-17）. ^ Virgin Australia orders 23 737 MAX aircraft, delivery between 2019 and 2021. [2013-07-28]. （原始内容存档于2013-12-13）. ^ Boeing, United Airlines Finalize Historic Order. [2013-07-28]. （原始内容存档于2012-12-31）. ^ Boeing, Avolon Finalize Order for 737 MAXs and Next-Generation 737s. Boeing. [2013-07-28]. （原始内容存档于2012-10-17）. ^ Staff. SilkAir finalizes order for 54 737s. Global Travel Industry News. [2012-11-14]. （原始内容存档于2013年4月20日）. ^ Icelandair Group and Boeing finalize orders for 737 MAX. GlobeNewswire. [2012-11-14]. （原始内容存档于2013-12-13）. ^ 87.0 87.1 Boeing 787: Current Year Orders. The Boeing Company. 2013-06-18 [2013-06-22]. （原始内容存档于2012-05-25）. ^ 濟州航空斥資1,823億元 買50架波音737 MAX. [2018-12-10]. （原始内容存档于2018-12-11）. ^ 福州航空引進首架波音737MAX飛機 機隊規模達17架. [2018-12-10]. （原始内容存档于2018-12-11）. ^ "ICAO Document 8643. "[永久失效連結] International Civil Aviation Organization. Retrieved: February 18, 2011. ^ Boeing: Airlines ground 737 Max 8 jets after latest crash. 2019-03-11 [2019-03-14]. （原始内容存档于2019-03-11） （英国英语）. ^ Boeing 737 MAX 8 Operators. www.planespotters.net. [2019-03-14]. ^ @nikphillips666. On delivery to Lion Air is Boeing 737 MAX 8, PK-LQP, from Boeing Field (推文). 2018-08-14 –通过Twitter. ^ Lion Air Datangkan Pesawat Baru Boeing 737 MAX 8 ke-10. Tribunnews.com. 2018-08-15 [2018-10-28]. （原始内容存档于2018-10-29） （印度尼西亚语）. ^ CNN, Euan McKirdy,. Lion Air flight crashes en route from Jakarta to Pangkal Pinang. CNN. [2018-10-29]. （原始内容存档于2018-10-29）. ^ Explainer: Unraveling the Boeing 737 MAX Lion Air crash. Reuters.com. 路透社. 2018-11-15 [2018-12-17]. （原始内容存档于2018-12-18）. ^ 埃塞俄比亚航空一客机坠毁 机上载有157人. 2019-03-10 [2019-03-10]. （原始内容存档于2019-03-29）. ^ 飞往“飞机坟场”的波音737MAX迫降 信任度再下降. 新京报. 2019-03-27 [2019-03-27]. （原始内容存档于2019-03-27）. ^ 华尔街见闻. 折翼？ 两起空难可能毁掉波音的梦想_飞机. www.sohu.com. [2019-03-14]. （原始内容存档于2019-03-27）. ^ 737 Model Orders and Deliveries data. 波音公司. 2019-03-01 [2019-03-13]. （原始内容存档于2019-03-13）. ^ American Airlines extends 737 MAX cancellations through June 5. [2019-04-08]. （原始内容存档于2019-04-08）. ^ 延至8月中旬 美国航空继续停飞波音737 MAX. [2019-04-15]. （原始内容存档于2019-04-15）.